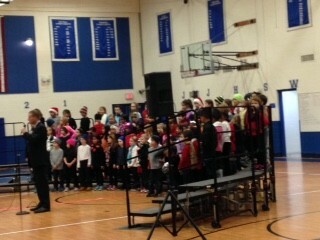 The highlight of our week was certainly the 1st/2nd grade performance of "Bring on the Snow". 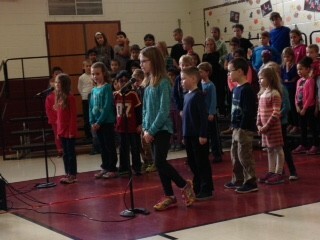 The students were very excited to perform for the student body as well as all of the parents, siblings, grandparents, aunts, uncles, cousins, and friends who came out to see it. 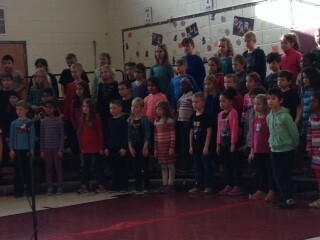 They did an amazing job and we were very happy to see such a successful performance put on by Ms. Clark and the wonderful first and second graders! The presentation at Jefferson Junior High. We celebrated holidays around the world by researching a little information about different countries. 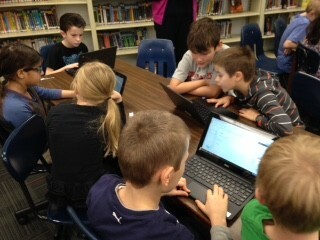 We used Google Docs and Google Research and paired up with a student from Mrs. Morris' class to research. Mrs. Sayre led us on this adventure and we were able to use the LRC to have more space to spread out and research. 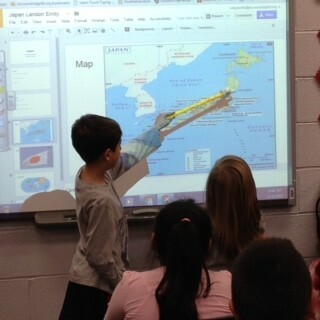 Today, the first half of the students presented their findings to both classes as a celebration of our learning! We will continue after break. Don't forget to try and use TumbleBooks over break. It's a great activity to do when you hear those famous words, "There's nothing to do!" 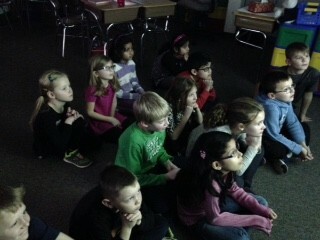 We watched and listened to a couple of holiday books this week during DEB. This week we did a couple of special class building activities. 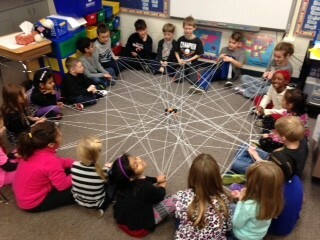 The first was making a spider web by tossing yarn back and forth to make a class web. The second was 'Christmas with the Right Family' where the students passed a present back and forth by following left, right, and across directions. The prize inside was some finger puppets. 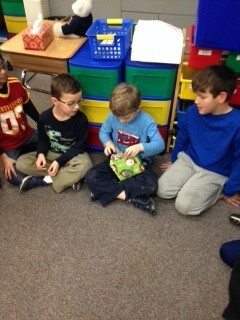 The package ended up at Jaden so he got to open it. 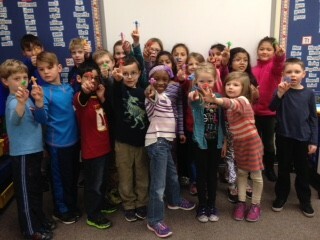 Everyone got a monster finger puppet. In your student's Friday folder is Greg Tang's 2nd Grade New Year's Math Challenge. Give it a try if you have some extra time. 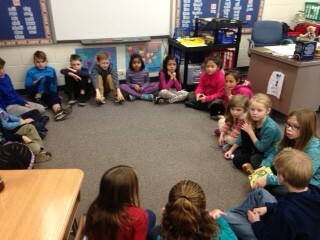 The students enjoy going on XtraMath in school to practice their math facts. That's another activity they can do over break. 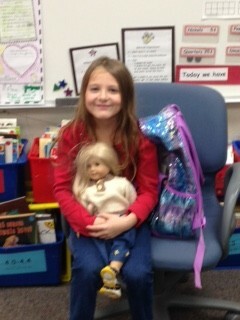 Ava was our Star Student this week. 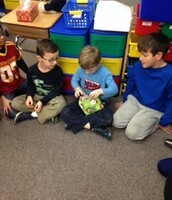 We learned that Ava has 2 brothers, Ethan and Jaxin. She has traveled to Mexico twice. The saddest thing is that she is moving in January and we will miss her terribly! Our next Star Student is . . . Maya! 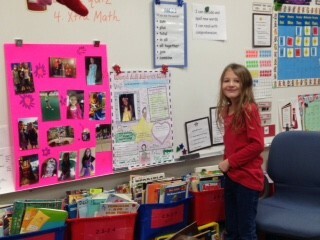 Ava giving her presentation, reading her chart and telling about the pictures she brought. 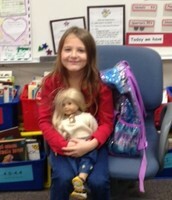 Ava has an American Girl look-alike doll. 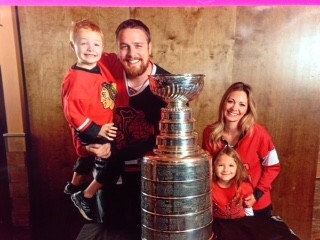 Her family with the Stanley Cup. 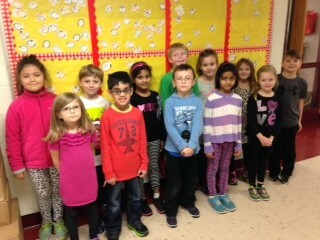 We have two weeks worth of AR winners this week. Due to the assembly last week, prizes weren't handed out. So we have a wonderfully large group this week! Don't forget we hope every 2nd grader makes their goal. The quarter ends on January 22nd so there is only 3 weeks after break to make those goals. GO READERS! Winter break begins on Monday, Dec. 21, and goes through Friday, Jan. 1. School will resume on Monday, January 4, 2016. Thank you SO much to the party moms who provided a fun time for the kids!